Derek and Brenda Denton have recently celebrated their Diamond Wedding Anniversary - 60 years of marriage. The marriage took place in Lincoln on 28th July 1946. Derek is an Old Briggensian born in Scawby Brook in 1922. He served in the RAF during the Second World War, which included flying Dakotas in the Far East. After the war he remained in the forces for a further 4 years as a flying instructor at the Queen’s University Air Squadron in Belfast, then moving nearer home to Doncaster to the Training Reserve flying school for a further year. In the early 1950’s Derek moved back to Scawby Brook to the house where he was born, and has lived there ever since, following the same occupation as his Father as a Potato Merchant. Thanks to the daughter of the late David Riggall (see the 2006 Newsletter), we are publishing his lively and fascinating memoir of ten years as a Boarder at Brigg Grammar School (1921-1931). The first four parts are online now - click here. Thanks to the dedicated efforts of Mike Spencer, all back numbers of the "Briggensian" school magazine from Spring 1927 to its final issue in July 1963 will soon be are now available via our Library Page. Mike has scanned each and every one and has turned them into searchable Adobe Reader documents. There is a link for downloading the free Adobe Reader program if you don't have it. These are unique and fascinating historic documents, and more will be joining them soon, because Mike has now tracked down in Lincolnshire Archives all the other issues from the very first in Spring 1914! First Meeting For 54 Years! 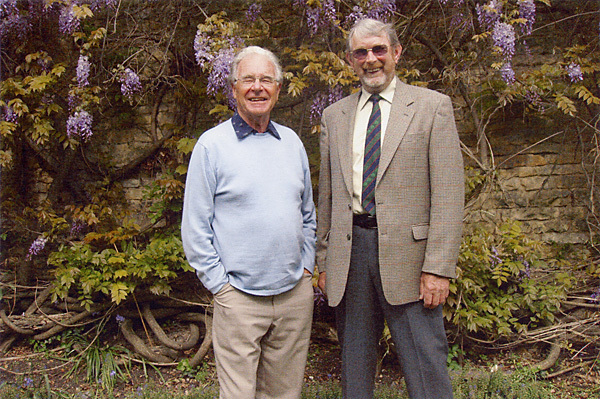 After a gap of 54 years since their last contact when leaving School, Brian Thornalley (right) and Mike Willey (left), both 1945-1952, with their wives, met for lunch at The George of Stamford on 16th May 2006. As a protegé of "Timber" Watts, Brian trained as a craft teacher at Loughborough College and retired in 1990. Mike graduated in economics and retired early after a successful sales career with I.C.I. A longer version of Mike's report will feature in the next edition of the Briggensian Newsletter. John Rhodes, whose memories of BGS in the years 1941-48 are available in our Library, writes that he has inadvertently lost the e-mail address of RJ Oxenham. Can anyone help John with this information? If you can, please e-mail him - see the Contacts Page and E-Mail List.